This is something fairly easy I made in the fall, I wanted to write a little bit about if remember it for future use. 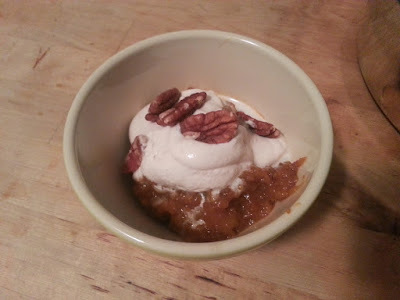 This was a very tasty pumpkin dessert I made one day after dinner. 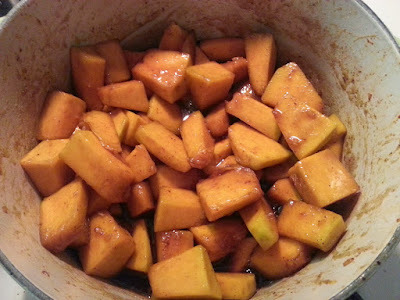 I began by sauteeing chunks of pumpkin in butter with cinnamon, ginger, chile ancho, brown sugar and some maple syrup. I placed this combination in the oven for about 20 or so minutes, basically until the pumpkin softened. After removing from the oven I simply mashed the contents of the pan and served in a bowl. Using a stick blender I mixed heavy cream, maple syrup and cinnamon to make a maple whipped cream to put on top. I added a few walnuts for crunch and it was ready to go. A very tasty fall dessert.